Here are some comments and feedback on Great Fire. 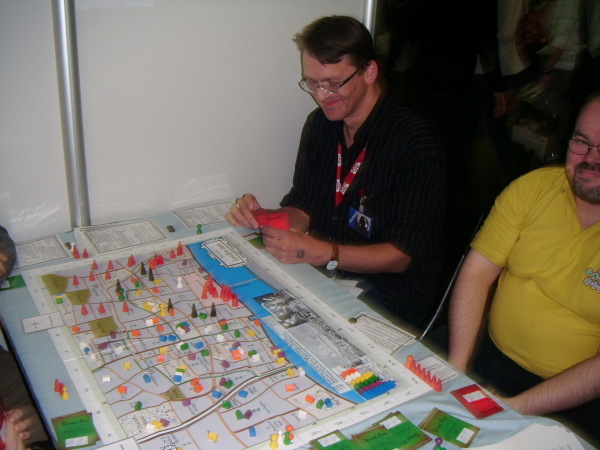 On Saturday 24th October 2009 there was some play test sessions of the prototype of Great Fire on offer on the JKLM stand (Hall 9-49). "I signed up for one the playtesting sessions for Great Fire and it was an absolute blast. I love how the mechanics feel quite elegant without any fussy rules, yet they're completely interwoven with the game's theme. This will definitely be the game to check out for those people who complain about the weak themes in eurogames. I can't wait until I'll be able to buy it." " The theme is as dense as the fire starting at "Pudding Lane", where an uncautious baker started the historical "Great Fire". And the mechanisms are developed perfectly to create an atmosphere of fighting against a semi-controlled fire. Each player gets fire cards (to influence the direction the fire expands) and has 4 actions each turn, commonly used to move their own pawn or the "trained bands" of militia fire brigades, which can be moved by anybody. The fire is represented by red cones, and the trained bands by black cones you can put directly "on" the fire - having it under control, but not yet put out. To really put out one of the cones, you need to have your own pawn in the same district as some trained bands who are fighting the fire. If you put a fire cone out, you get it (for later scoring). BUT: Of course, London is full of houses. All 120 houses included in the game are randomly, but equally allocated on the districts (read "blocks"). And each house of a player burnt down, will score him -2 points. AND: Each player has three special "important" buildings he is (secretly) responsible for to save them. We played with four and had a great hour of gameplay! The scoring was very close. Houses and cones equalled out, only the "important" buildings, revealed at the very end, made the difference. The fascination here is, that you don`t build something up, as it is more usual, but you destroy step by step, the Capital city! The gameflow is absolutely intuitive, because it is "logical" (how the fire is expaning, what you can do to create barriers - by demolishing houses, for example) and it has a co-operative feeling, while the aim of the game has nothing cooperative at all! During the course of the game, the fire went east first, then north, then south again, having a blank "hole" in the middle - with the important building of the final winner (Royal Exchange) surrounded by fire, but not burned down! After the game we talked about the (everybody enjoyed very much!) and some design questions. Is the track around the board necessary, if the scorimng only happens at the end? How about language-independent cards, so players who are looking at London "the wrong way" could held their cards according to their perspective, making it easier to see, in which direction the fire can expand ... it was a fine experience to be (a small) part of the development process. Thanks for bringing that along, Richard - and good luck for this! "